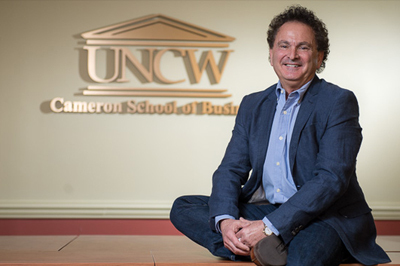 In his 11th year of chairing Business Week at the Cameron School of Business, Drew Rosen (Duke Energy/Gordon Hulbert Professor of Operations Management) says the event was one of the deciding factors that brought him to UNCW. 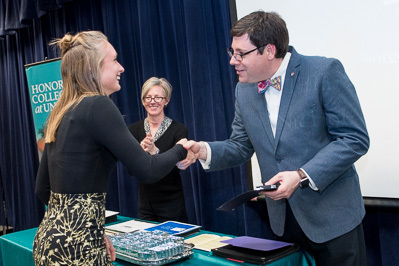 Honors College faculty members Nathan Grove and Jennifer Horan congratulate Fulbright recipient Tiffany Ernst ('17) during the Honors College Recognition and Awards Ceremony on March 17. The college will recognize more students during the Spring Student Research and Creativity Showcase being held today and tomorrow.